It rained a little yesterday…and by a little I mean it was the most rain I have ever seen in my life! 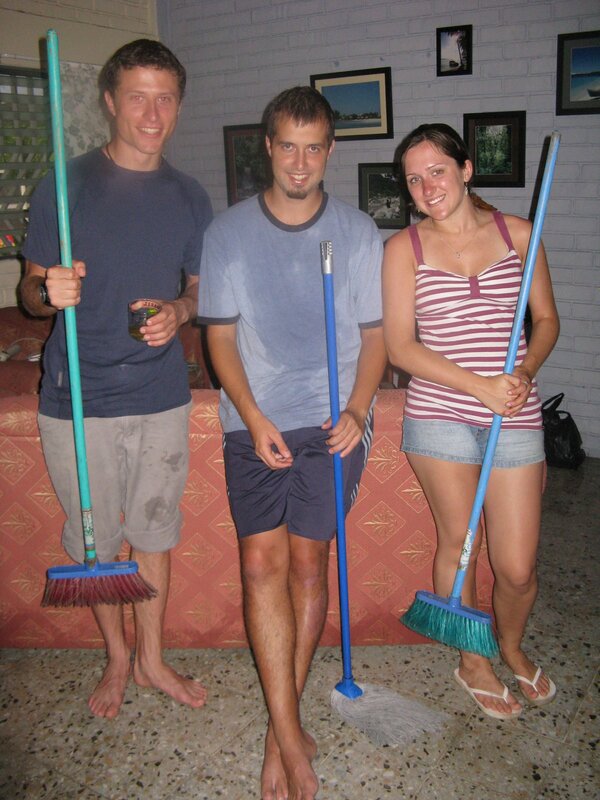 David, Danielle and I were at Guamilito (the mercado) and came home to find Alex and all the neighbors frantically sweeping out our apartment. 2+ inches of water flooded our entire first floor! We don’t have many action shots since everyone was a little busy, but here are a few after shots to give you an idea…. Little did David and Danielle know that we would put them to work during their visit! Notice how wet the bottom of our couch is. While trying to get home from the market I lost my shoes! The three of us were stranded for about 45 minutes unable to leave the market because the lightning was too dangerous. When we finally managed to flag a taxi down we had to wade into the nearly 1 foot deep water flowing down the street. As I picked up my foot to take a second step my flip flop shot down the road never to be seen again. I decided there was no point in keeping only one flip flop and made the rest of my way home barefoot. 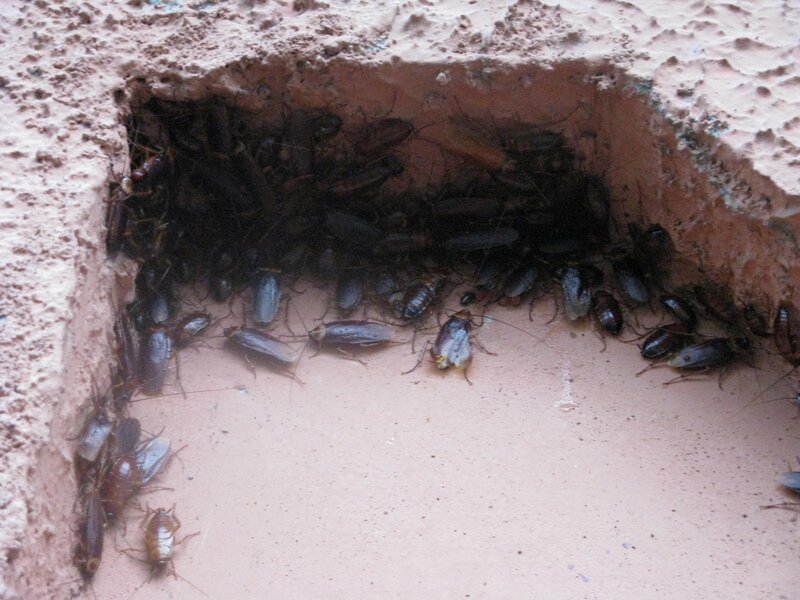 Did you know that cockroaches don’t like water? After the storm passed, our guard pointed out the massive amounts of them clinging to the sheltered areas of the wall around our complex. These guys are all about 1.5 to 2 inches long. Jim Leidel would love a wastebasket full of those dudes. Did Jesse want them for his classroom? Bet he already has a plentiful supply, huh?I love not only the action shot of the guys rustling them off the wall like cowboys, but the laughter, or was that screaming in the background! You guys should make movies! I’m also very glad I could watch it from the comfort of Wisconsin, not the streets of Honduras. ISH! What an adventure! I have lots of memories of cockroaches, YUK!! Really got a laugh out of your video.I hope your flipflops were old ones Caitlin.When you were very young Alex and living at Eagle Heights, I was visiting, got up to go to the bathroom in the middle of the night. When I turned on the light the whole floor seemed to move, it was very small newly hatched cockroaches. I think I just started stamping on them . I’m sure mom and your dad can relate also.My teacher isn’t here to correct my sentence structure, Sorry!Grandpa says SG Ericksson will be coaching soccer in Mexico.